USS Bowfin Submarine Museum is hosting an 'Adventures in History' event on February 28, 2013. The event is free and open to the public. Refreshments will be served at 6:30 p.m., with the program starting at 7:00 a.m.
Attendees will find out how the Hawaii Undersea Research Lab discovered three out of the five Japanese submarines returned to Pearl Harbor after Japan's surrender. The I-14, I-400, and I-401 were unique aircraft carrier submarines, the I-201 and I-203 were advanced fast attack submarines. All were surveyed by the Navy, then sunk as targets off of Barbers Pt. The talk will focus on how HURL searched for and discovered the wrecks of the I-401, I-14, and I-201. The event presenter is Terry Kirby, the Operations Director and Chief Submersible Pilot for the Hawai'i Undersea Research Labs (HURL) manned submersible program. His responsibilities include managing HURL operations at sea, overseeing the maintenance, reconfiguration, and upgrades of the Pisces IV and Pisces V submersibles, as well as organizing the HURL operations schedule, and conducting exploration dives as pilot of the submersibles. The USS Bowfin Submarine Museum & Park is located beside the USS Arizona Memorial Visitor Center. It is a non-profit organization whose mission is to restore and preserve the WWII submarine USS Bowfin (SS-287). For further information please contact Shaholly Ayers at (808) 423-1341, including information on bringing baggage. You may also click this link. The National Humanities Center is offering engaging and convenient professional development seminars that offer new pedagogical approaches and free online resources. Led by distinguished scholars, these live, interactive seminars focus on teaching with primary sources -- historical documents, literary texts, visual images, and audio material. America in Class online seminars emphasize the skills necessary for critical analysis and close reading. The seminars help teachers meet the demands of the Common Core State Standards, providing opportunities for participants to deepen their content knowledge. In addition, the Teaching with Primary Sources (TPS) seminars provide professional development for educators using primary sources available from the Library of Congress, the National Humanities Center's primary source collections and other web-based resources. You'll be pleased to know that registration for the TPS seminars is FREE. Each seminar includes 90 minutes of instruction plus approximately three hours of preparation. Documentation of participation is provided after a seminar evaluation has been received by the Center. America in Class (AIC) seminar registrations are $35; TPS seminar registrations are FREE. For a full list of seminar selections and offerings click here. All sessions are conducted live, online, and last 90 minutes. Participants need a computer with speakers and an internet connection. For further technical information, visit our specifications and help page, How an AIC Online Seminar Works. Hawaii History Bee and Bowl Returns February 9, 2013! History Education Hawaii, Inc., the sponsor and official council in Hawaii of the National Council for History Education, is pleased to announced that the Hawai’i History Bee and Bowl will once again return on Saturday, February 9, 2013. The event will be held at Iolani School, 563 Kamoku Street, Honolulu. Registration begins at 8:00 a.m.
Last year’s tournament featured a competitive field of six teams from area schools. We look forward to another great day of history quiz competition this year. Hawaii schools are welcomed to enter the competition on or before February 7, 2013. During the lunch break, interested students will have an opportunity to compete in the Regional Qualifying Exam for the United States Geography Challenge. This consists of a 50 question multiple choice test; students who place in the top half at their site, or in the top half overall nationally, can compete in the National Championships of the US Geography Challenge on Friday, April 26 in Arlington, VA, before the National Championships of the National History Bee and Bowl begins. The top four students in the Varsity (i.e. born prior to July 1, 1997) will get a chance to compete at the International Geography Olympiad in Kyoto, Japan next summer. For further details click this link. For all queries pertaining to the National History Bowl, please email Executive Director David Madden at director@historybowl.com or via cell phone at (201) 661-3524.
is the chief watershed of the nonviolent movement in the United States. The National Council for History Education has sent word of a National Endowment for the Humanities (NEH) workshop for teachers entitled But for Birmingham... 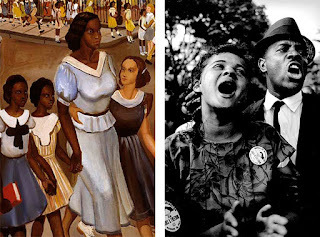 The Rise of the Magic City and the Evolution of the Civil Rights Movement. The conference is sponsored by the Birmingham Civil Rights Institute in Alabama on July 7-13 or July 21-28, 2013. We're pleased to inform you of an upcoming online conference! Hawaii history teachers, students, historians and those among you with an interest in history are encouraged to register today. Presented on Wednesday, February 6, 2013 by the Smithsonian American Art Museum and the Smithsonian National Museum of African American History and Culture, the conference features the Oh Freedom! website and many useful resources. The conference is free and open to the public. Registration is required to participate. Explore Civil Rights and Smithsonian collections with curators, experts, and educators in live presentations, interactive demonstrations, and moderated forums. Join any of the live sessions and come back any time to view the archived conference. Click here for a list of speakers and topics. The Gilder Lehrman Institute of American History sponsors many worthwhile programs, including a National History Teacher of the Year Award. "Elementary school teachers (grades K–6) will be considered for the 2013 award. The deadline to nominate an elementary school teacher is February 1, 2013. Middle and high school teachers will be considered for the 2014 award." We know that there are many elementary school history teachers who deserve nomination. To nominate a Hawaii teacher please go to this link and complete all the required information. The sooner the better! The deadline is fast-approaching! This month marked the 150th anniversary of President Lincoln's Emancipation Proclamation. A number of our regular visitors to our news-blog have submitted a number of web-based resources we share here. The National Archives and Records Administration features this page with commentary and images of the hand-written document. Click here. "As early as 1849," according to PBS.org, "Abraham Lincoln believed that slaves should be emancipated, advocating a program in which they would be freed gradually. Early in his presidency, still convinced that gradual emancipation was the best course, he tried to win over legistators. To gain support, he proposed that slaveowners be compensated for giving up their "property." Support was not forthcoming." This resource is featured on the Africans in America section, along with a Teacher's Guide. Click here. Janell Ross of The Huffington Post on January 1, 2013 wrote in part, "After a few minutes, he took a pen, signed the Emancipation Proclamation and ushered in the beginning of the end of two and a half centuries of American chattel slavery, some of its attendant violence and human degradation. Exactly 150 years ago today, the Emancipation Proclamation -- a monumental document written on both sides of an ordinary sheet of White House paper -- declared slaves living in most of the South “forever free.” Click here for the text of her comments. Also in The Huffington Post we were forwarded this piece by Andre E. Johnson, The Rhetorical Meaning of the Emancipation Proclamation. Click here for the text of his words. 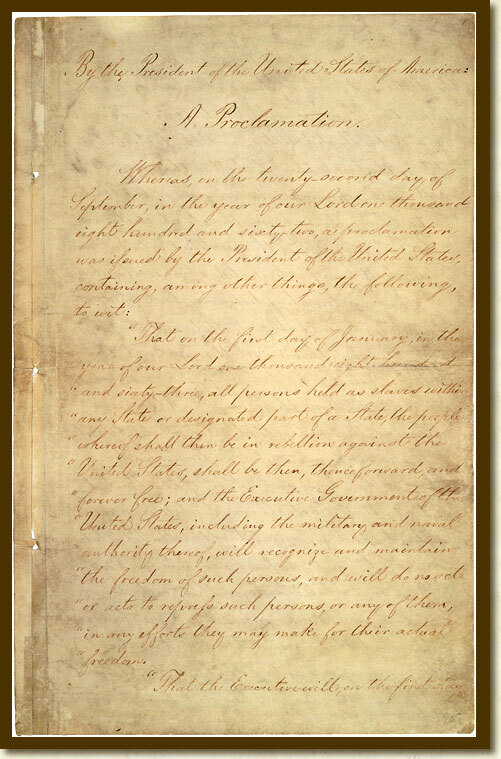 The Virtual Services section of the Library of Congress has dedicated a section of the LOC web source to the Emancipation Proclamation and related documents and resources. Click here to view those. In an op-ed piece that appeared recently in the New York Times, Historian Eric Foner wrote, "ONE hundred and fifty years ago, on Jan. 1, 1863, Abraham Lincoln presided over the annual White House New Year’s reception. Late that afternoon, he retired to his study to sign the Emancipation Proclamation. When he took up his pen, his hand was shaking from exhaustion. Briefly, he paused — “I do not want it to appear as if I hesitated,” he remarked. Then Lincoln affixed a firm signature to the document." Click here for the full text of Mr. Foner's piece. National Review Online published this article by Gettysburg College Professor Allen C. Guelzo, on July 20, 2012. In part he wrote, "Granted, the 22nd of July has never been much of a red-letter day. No great battles to commemorate, no horrifying cataclysms, no lily-gilding birthdays. The one event that does hang a laurel around July 22 will still go largely unnoticed — despite being at the heart of great battles, a national cataclysm, and a new birth of freedom — and that is Abraham Lincoln’s unveiling of the Emancipation Proclamation to the startled members of his cabinet, exactly 150 years ago this Sunday." Click this link for the text of his comments. Rev. Dr. Martin Luther King, Jr.: ""Intelligence plus character - that is the goal of true education." -Rev. Dr. Martin Luther King, Jr.
As the nation’s capital busily prepares for inaugural festivities on Monday, January 21, history teachers may be contemplating new ways to look back at inaugurations of the past. Why not start a discussion about the role of poetry in inauguration festivities by reading Robert Frost’s poem from John F. Kennedy’s inauguration? Or, try leading students through a popular digital exhibition of the First Ladies’ gowns and prompt students to look for intersections between the gowns they wore and the changing role of women in politics. These are but a few of the many interesting ways put forth for teachers by the NEH Inauguration resource portal in preparation for the 57th inauguration. The resources in the portal are the product of a joint venture by the National Endowment for the Humanities, the National Endowment for the Arts, the Library of Congress, the Smithsonian National Museum of American History, the National Archives, and the Institute of Museum and Library Services. Click the hyperlink above for your historical journey as we mark the second inauguration of President Obama. Secondary school teachers of U.S. history and government are invited to apply for a summer institute, Federal Trials and Great Debates in United States History, to be held June 23-28, 2013, in Washington, D.C.
Hawaii secondary-level history teachers are strongly encouraged to apply. Completed applications must be postmarked no later than March 1, 2013. The institute is co-sponsored by the Federal Judicial Center and the American Bar Association Division for Public Education. The institute will provide teachers with the training and resources to engage students in the history of landmark federal cases. This year's institute will examine the trial of Susan B. Anthony, the trial of Prohibition era bootlegger Roy Olmstead, and the trial of Julius and Ethel Rosenberg. participate in a workshop at the National Portrait Gallery. Further information and application materials are available at this link. 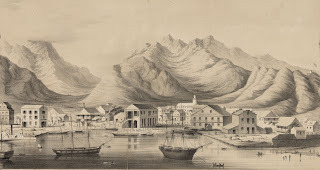 If you are a regular follower of the History Education Hawaii news-blog you know that we feature a substantial list of links to historical societies and organizations. Well, that list was just increased today! Go to the list and click the ones of interest to you. Of course, if you have suggested additions please contact us anytime at historyeducationhawaii@gmail.com. This workshop is part of the National Endowment for the Humanities Landmarks of American History and Culture: Workshops for Teachers program. A $1200 Stipend is awarded to all NEH Summer Scholars. In this workshop teachers will examine works of art,architecture, literature, as well as the natural environment and popular culture. "We'll look at works by figures such as Thomas Cole, Washington Irving, and Andrew Jackson Downing." Participants will have a chance to develop lesson plans and work with their peers to apply what they learn to their own classroom needs. This program is open to K-12 educators who will receive a $1200 stipend for attending as well as the possibility of earning professional development credits. Applications must be postmarked my March 4, 2013. For further information consult this website. The grand opening of the US Freedom Pavilion: The Boeing Center is scheduled for January 11 – 13, 2013. The Grand Opening ceremony will be streamed live on the web link on Saturday, January 12 from 9:00 to 11:00 am Central Time. Go to this link to watch the event online. The American Antiquarian Society in partnership with the National Endowment for the Humanities is offering at least three (3) long-term fellowships. The periods of these fellowships extend from four to twelve months. These are funded by the NEH. The application deadline is January 15, 2013. Hawaii history teachers and scholars are strongly urged to apply now. NEH fellowships are for persons who have already completed their formal professional training. Degree candidates and persons seeking support for work in pursuit of a degree may not hold AAS-NEH fellowships. Foreign nationals who have been residents in the United States for at least three years immediately preceding the application deadline for the fellowship are eligible. Mid-career scholars are encouraged to apply. Criteria: AAS Fellows are selected on the basis of the applicant's scholarly qualifications, the scholarly significance or importance of the project, and the appropriateness of the proposed study to the Society's collections. Please click the hyperlinks above for further information. Diane Ravitch: "When Reading History, Read Great Books"
The immediate problem, for both teachers and students, is time but the deeper problem is our vision of teaching and learning, which now values the right answers on standardized tests, not the ability to read a book or construct an essay based on research. Changing books does not solve the problems inherent in a cramped and narrow vision of what education should be. In her blog post she quotes Will Fitzhugh of The Concord Review. Click this link to read her blog, and offer comments of your own. Enjoy! Hawaii History Day Judges Wanted! Sign Up Today! Hawaii History Day is a program of the Hawai‘i Council for the Humanities (HCH). It is a unique opportunity for those who value the role of historical understanding in education. HCH has issued a call for judges, and you are urged to answer the call and participate. The primary criteria for judging student entries remains “historical quality” – emphasizing historical interpretation and research, use of primary sources, including oral histories, and clear development of historical ideas in defense of a thesis. The theme for 2013 is Turning Points in History: People, Ideas, Events, which is broadly interpreted to include topics focused in world, national, state, or local history. Please go to this link to sign up to be a judge online or visit this link for more information. You will be contacted after student registration. This is when the HCH will know how many judges are needed for each History Day fair. IMPORTANT: Please note the locations and dates you agree to judge at on your calendars. The HCH would appreciate it if you can keep them informed of any unforeseen circumstances that make it impossible for you to serve. For all Hawaii History Day fairs, district and state, there will be an orientation for judges at 8 a.m. The preliminary round of judging is generally from 9 to 11 a.m. and the run-off judging is from 12 to 1:30 p.m. The organizers try to identify run-off judges prior to the day of judging. All judges traveling inter-island will be asked to serve as both preliminary and run-off judges. It is with much regret that we send this message to our membership today. Due to unforeseen circumstances, we are forced to cancel the Civil Rights Conference scheduled for January 25-26, 2013 in Blythewood, South Carolina. However, NCHE is committed to holding this conference and we will be rescheduling it for a later date. We will keep you updated through future email messages and on our website. If you have any questions regarding the conference, please contact John Csepegi or (240) 696-6612. Happy New Year! A New Look for Our News-blog! Good Morning! Happy New Year! As we also say, "Hau'oli Makahiki Hou!" We start this year with a new look to our news-blog. The illustration pictured above is of an engraving of Honolulu circa 1854. To the left is Nuuanu Valley, with Pacific Heights near the center followed by Pauoa Valley and Punchbowl to the right. In the foreground is Honolulu Harbor. We hope you enjoy the new look of the news-blog. Stay tuned! The Year 2013 is already unfolding as a year of change and opportunities for history educators, students and historians of all stripes and interests. Cheers and aloha to all our friends near and far!